A 65-year-old man referred to as MX once thought that he was like everyone else until he discovered his glitch: he could not imagine or have any voluntary imagery. He had Aphantasia, a characteristic that made it impossible to create any voluntary mental imagery (Zeman, et al 2015). He came to develop his glitch after a cardiovascular operation that took away his ability to imagine. Aphantasia was first described in 1880s by Francis Galton, and only recently someone took interest in this phenomenon once again. (Zeman, et al. 2015). When MX discovered that he was not able to have any visual imagery he reached out to Professor Zeman who performed some tests on him. The tests would help determine if MX’s pathways responsible for visualising objects would be activated during the experiment. He was first asked to recognize the pictures shown to him during a brain scan, and in the second part of the experiment he was asked to visualize in his mind’s eye. The first experiment consisted of showing different images that MX was most likely to recognize, like the prime minister of the UK, and the second part of the experiment required MX to imagine in his mind’s eye the prime minister. In the first case, MX’s brain showed the pathways and regions responsible for processing vision and recognition lit up, but when it came to imagining in his mind’s eye, the activity decreased or remained silent. In other words, the pathways that were responsible for visualizing, creating and receiving the signals from the outside world did not function in MX’s brain (Zimmer, 2010). The posterior areas of MX’s brain showed a decrease in activity while the frontal area showed an increase in activity, indicating that MX’s brain had developed a strategy to perform tasks that required visual imagery. The results of Zeman’s test indicated that MX has a high IQ, reliable memory, normal vision and intact networks responsible for processing memory (Zeman, et al. 2015). The brain areas responsible for visual imagery are dispersed across the brain (Aldworth, 2010). 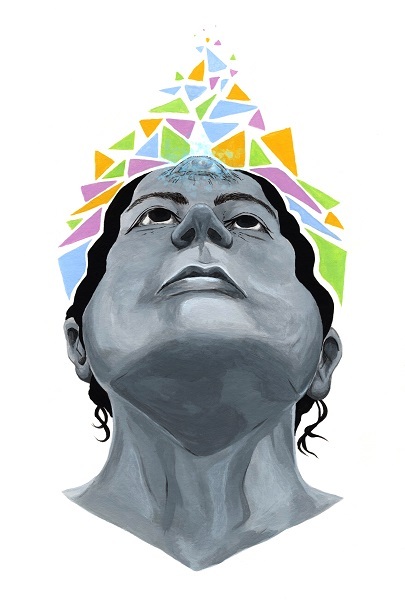 The frontal lobe and the parietal lobe work together to organise the visual process and the temporal and occipital lobes are responsible to represent the mind’s eye and to give visualisation its visual feel (Aldworth, 2010). Research has shown that individuals with Aphantasia are likely to have a reduced or absent voluntary and involuntary imagery in their mind’s eye or dreams (Aldworth, 2010). Researchers explained that when the eye detects an object it captures the information and causes the brain to activate certain pathways of neurons that are unique to the object (Grinnell, 2016). In other words, a chair would have its own pathway and a table would have another pathway when visualizing (Grinnell, 2016). Those same neural pathways are also activated when imagining or picturing an object in your mind (Grinell, 2016). Those pathways are, however, weaker than the pathways activated when actually seeing the object (Grinell, 2016). Another individual with a similar glitch to MX is the well-known founder of Mozilla, Blake Ross. He had experienced this glitch from his childhood. He explains that he never visualized anything in his life and that even his dreams never had any visual or sensory components in them (Mulholland, 2016). Ross also mentioned having trouble recognising faces and place and surprisingly never had a song stuck in his head. This shows that there are different types of Aphantasia : Total Aphantasia is characterized by the inability to create images, sound, taste, smell or touch with their mind’s eye, which would explain why Ross never had a song stuck in his head (Broad, 2014). A small research project was undertaken on some teachers and students of Dawson College. The research had a sample of 170 people and was completed during the month of November 2016. The hypothesis of the study was that 2 to 5% of the participant would show evidence of Aphantasia. The participants were given an online questionnaire called the Vividness of Visual Imagery Questionnaire to measure their score of visual imagery. The questionnaire required participants to rate different mental images to test the strength of the mind’s eye on a scale of 1 to 5 (Gallagher, 2015), 1 meaning no imagery at all and 5 meaning vivid and clear imagery. Participants who scored 15 and less on 40 were given a second questionnaire asking their interest, program of study, their visual imagery in their dreams and more. 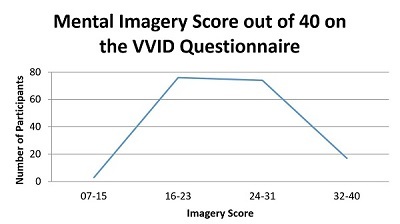 This second questionnaire was also given to those who had scored more than 38 on the VVID Questionnaire because they showed evidence of a high level of mental imagery. The results showed that out of 170 participants, 3 of them showed evidence of Aphantasia. Results show that participants had little difference in their choices concerning their program of study and artistic ability. However, participants with Aphantasia mentioned having difficulty following maps, having no interest reading books and their dreams did not contain much imagery. Participants who showed signs of Aphantasia described their dreams being less vivid with less visual imagery. They mentioned having difficulty following maps. Participants who had a score of 38 and higher mentioned having no trouble following maps, enjoying reading on their free time and having vivid and detail imagery in their dreams. Although this study was small it was still possible to find the number of people showing evidence of Aphantasia close to the number that was predicted. Natalia Czaharyn is a first year Illustration student.